So far, you’ve seen the Exchange Online Admin Center, the Skype for Business Online Admin Center and briefly touched on the Yammer Admin Center. Now it’s time to dive into the SharePoint Online Admin Center as well as the OneDrive for Business Online admin center. While both of these products are technically SharePoint, they each of their own Admin Center. If you know me, you’ll know I have a long history with SharePoint and could easily create another email course just on SharePoint admin (and maybe I will). So, I’ll try not to get long winded here and just provide an overview of the SharePoint Admin Center. Before that though, if you’re brand new to the space, SharePoint is Microsoft solutions for corporate intranets and team collaboration (files, calendars, lists, announcements, forms, etc) at a super high level! There is a lot you can do in SharePoint, I’ll provide a lot more around SharePoint in the membership section of my site and you can often find me talking about SharePoint at various conferences and user groups. But, back to the admin center. As with Exchange, there are a lot of options here, so I’ll hit the highlights. site collection: this is the heart of SharePoint. Without site collection, SharePoint wouldn’t exist. Think of a site collection as a self-contained site. Within each site collection, you can have unique permissions, store all your team files, have various calendars and lists, store electronic forms, even share files externally with contractors, vendors or clients. This is where you manage all the site collections within your SharePoint environment. user profiles: SharePoint syncs your users and some of their info from Active Directory (or Azure AD for SharePoint Online) into SharePoint. This can then be used to search for people and their information, create employee directories, and auto-fill forms with things like your manager, email, and first and last name. This is where you control the settings for the user information that is synced into SharePoint. search: SharePoint has a powerful search service built right into it. This allows you to search web pages in SharePoint, Documents, and files stored in SharePoint (including the text within the documents) and people brought into SharePoint via user profiles. This section lets you control and customize the search experience within your environment to fine tune it based on your specific needs. sharing: This is an important setting to be aware of. As mentioned earlier, SharePoint does allow you to share with user external to your organization. This is where you can control that sharing at the organization level. It may be that you want to entirely block external sharing, or maybe only allow sharing to certain email domains. Maybe it’s if you allow anonymous links to files or not. Your organization-wide sharing settings are all controlled here. settings: This is just a list of “random” miscellaneous settings for SharePoint. Stuff like if you allow syncing or not, enabling/disabling preview features, if you allow users to create sites or pages, showing/hiding certain links. You’ll definitely want to just take a look at this list to get an idea of what’s here. 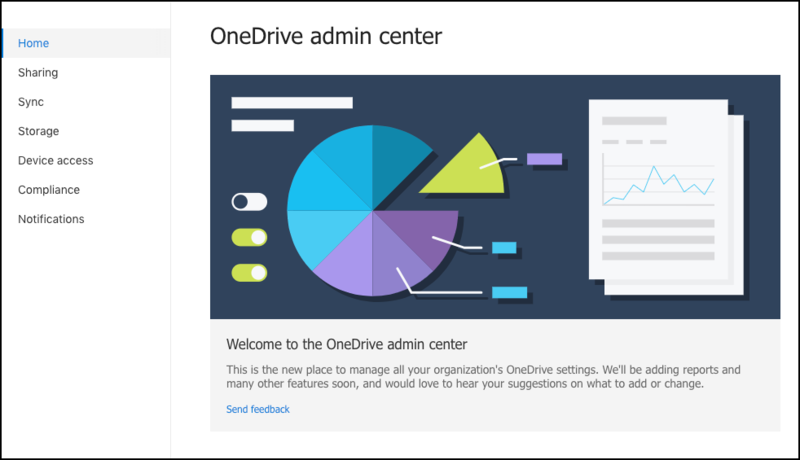 OneDrive, while still, part of SharePoint has its own admin center with some administrative options that apply just to OneDrive and help secure data stored in OneDrive. Sync: just a few settings around conditions for what can be synced and which devices content can be synced to. 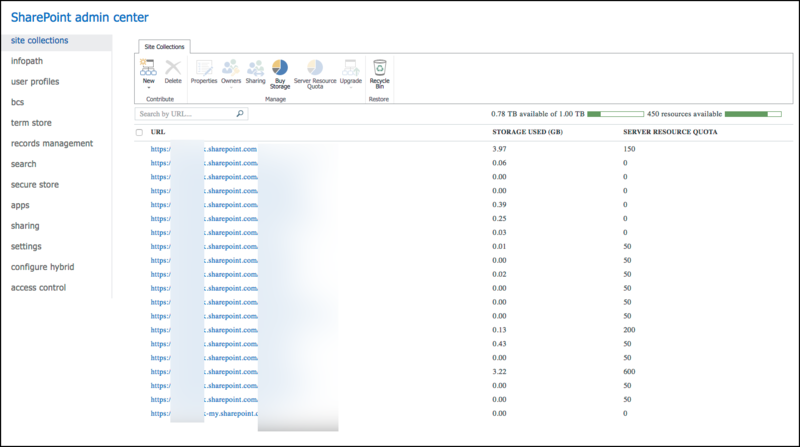 Storage: while you technically have unlimited storage in OneDrive for Business, you may not want users to have that ability, configure the default storage and how long you retain deleted files here. Device Access: condition access around which devices are allowed to access OneDrive. There are also some settings around here in blocking things such as downloading files, screenshots, printing, backing up data, etc. Notifications: Configure email alerts to OneDrive owners when: users you have shared with invite other external users, external users accept invites to access files, and anonymous links are created or changed. So there you have it, a high-level overview of SharePoint Online and OneDrive for Business Online. I even managed to keep it relatively short. As will all of the products, there is a lot more detail around administration and functionality that is included that we’re able to cover here. I’ll continue to work to provide even more details as I build out the content within the site.